Those who are analytical, good at problem-solving and can pay attention to detail might enjoy a computer science career. It is a promising field with employment outlook ranging from average to much faster than average over the next several years. Computer and information systems managers oversee the computer activities of organizations or companies. They implement technology that can help these entities meet their goals. While some employers hire job candidates with a bachelor's degree, many prefer those with a master's degree in business administration (MBA). Computer and information systems managers' median annual earnings were $123,950 in 2013. Computer systems analysts assist their employers with the efficient and effective use of computer technology. Many employers prefer to hire job candidates who have bachelor's degrees, and for more complex jobs, some require a master's degree. In 2013 computer systems analysts earned a median annual salary of $81,190. Computer hardware engineers research, design, develop, test and oversee the manufacture and installation of computer chips, circuit boards and computer systems. They also work with computer peripherals. To work as a computer hardware engineer, one must earn a bachelor's degree. Also, to work directly with the public, one must have a license. Computer hardware engineers earned a median annual salary of $104,250 in 2013. Computers would be mere pieces of plastic without the computer programmers who write the programs that enable them to perform their functions. One must earn a bachelor's degree, usually in computer science, to work as a computer programmer. Computer programmers earned a median annual salary of $76,140 in 2013. Computer support specialists help companies' customers or staff solve computer-related problems. They may help with difficulties computer users are having with software programs, operating systems, computers or peripherals. While some employers will only hire computer support professionals, who have bachelor's degrees in computer science, the level of education required in this field varies. They earned a median annual salary of $46,620 (median wage of $22.41 per hour) in 2013. Systems software developers create operations software that make computers and other devices run. Applications software developers design and produce software and games that make them useful. While a bachelor's degree isn't a strict requirement for this career, earning one can help you prepare for it. In 2013 systems software developers earned a median annual salary of $101,410 and applications software developers earned $92,660 per year. Web developers are responsible for the way websites function. They tend to sites' technical aspects. 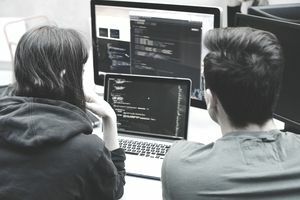 Although experience and certification may be enough to get someone a job as a web developer, many employers prefer to hire job candidates who have earned a bachelor's degree in a computer-related field. Web developers earned a median annual salary of $63,160 in 2013. Webmasters maintain websites and tend to tasks such as design, analysis of user data and responding to user feedback. For most jobs, one needs at least an associate degree or a certificate, but more advanced positions require a bachelor's degree in a computer-related major. Webmasters earned a median annual salary of $82,340 in 2013. Employment and Training Administration, U.S. Department of Labor, O*NET Online, on the Internet at http://online.onetcenter.org/ (visited January 12, 2015).